PLATE I. 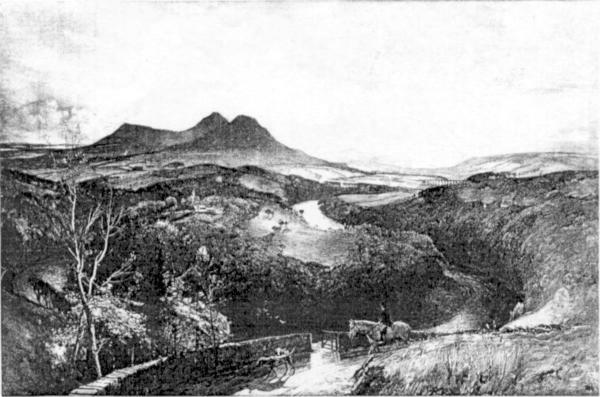 THE VALLEY OF THE TWEED LOOKING WESTWARD FROM BEMERSYDE HILL FROM A WATER-COLOUR DRAWING BY TOM SCOTT, R.S.A. The view is taken from the height above the precipitous rocky face known as the Gate Heugh, on the north bank of the Tweed. In the foreground lies the promontory of Old Melrose, the site of the early monastery of Saint Cuthbert. Behind it rise the three peaks of the Eildon Hills. The site of the Roman fort of Newstead lying in the middle distance on the south bank is indicated by the Railway Viaduct crossing the river in its immediate vicinity.